Spring is in the air which means the bluebonnets are blooming, oak pollen is falling off the trees (yuck) and the chickens are laying eggs again (yea)! It also means it’s Easter and time for another memorable Easter Egg Hunt for the kiddos. During the holidays, I try and do something festive with my cousins’ children that centers around the kitchen. They are 6 1/2 and 3 1/2, fabulously creative, incredibly curious and fantastically funny–as you can personally witness these truths below. Their personalities are well developed and it’s mesmerizing to witness them put life’s pieces of the puzzle together. On Christmas Eve, we made decorated sugar cookies that were left for Santa. The kids think that was why they got such great gifts, and I am not here to change their mind. Of course Santa loved our cookies! I had most everything I needed including beets, turmeric, a jar of espresso and a few bottles of leftover “house” red wine. All I needed was a head of red cabbage, curry powder and cheap (yes, you read right–no need to use good pastured eggs here since they will be used for decoration) white eggs. This is important because, first of all, it’s much easier to dye white eggs than brown eggs. 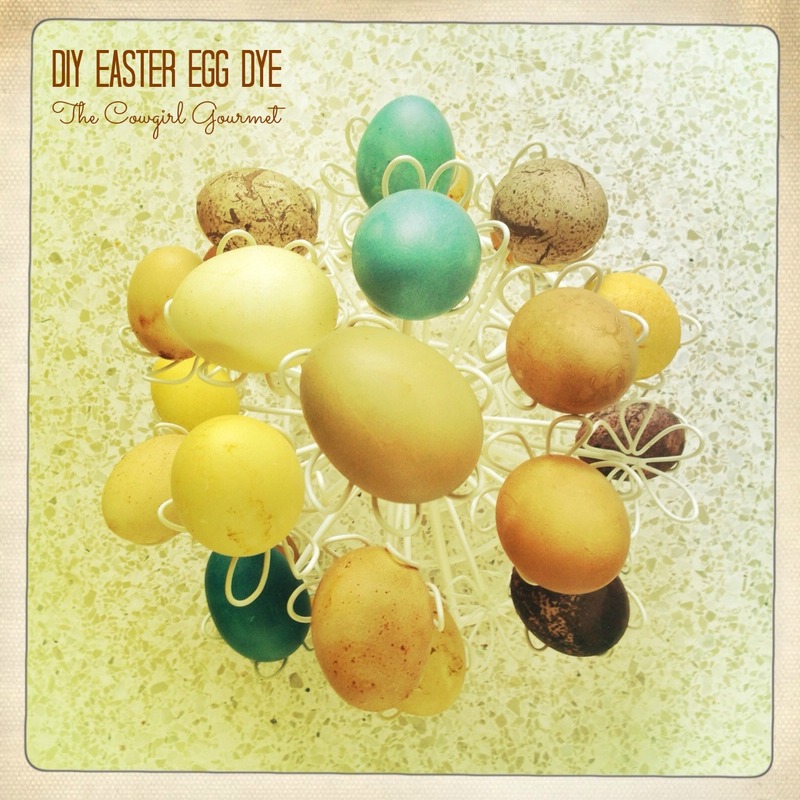 This is such an easy, fun, inexpensive and healthy way of extracting color from food to give unique and ranges of mellow to vibrant shades of color to our Easter eggs. From our family to yours, Hoppy Easter! Talk about fun! Not sure who enjoyed this activity more--me or the kids! This project is educational, exciting, inexpensive and healthy. Just choose vibrantly colored fruits, vegetables and spices to color Easter eggs. You'll be amazed by the process and the kids will be impressed with their success. Think red cabbage (blue), turmeric (vibrant yellow), cayenne/chile powder (burnt orange), coffee (mocha), blueberries (lavender), beets (red), cranberries or raspberries (red-pink). In a small pot, add 3 cups of water and bring to a boil. Add coloring ingredient and vinegar and return to a boil. Cover the pot, reduce the heat to medium-low and sinner 20-30 minutes. Carefully strain the dyeing liquid into a quart-sized container or wide-mouth mason jar, discarding the solids. Let the liquid dye cool. Repeat with each ingredient. When both the coloring dye and hard-boiled eggs are cool, depending on the amount of eggs you are dyeing, add a few eggs to each container of dye. Set aside, turning and stirring occasionally until the desired color is achieved. Expect to leave the eggs in the dye at least 2 hours, though overnight will provide more vibrant colors. When they are ready, transfer the eggs to a plate lined with a paper towel or newspaper and then return them to the egg carton until dry to the touch. Red wine for burgundy to purple eggs: You won't want to use the good juice for this activity, but perhaps you have some leftover half bottles sitting around that may be closer to vinegar now than wine. These would be perfect, as would a $5 or less bottle you pick up specifically for this task. Let the red wine replace the water and remember that the color will darken as it dries on the eggs.